Installing SalesIQ on your blog enables you to connect with your customers instantly. Also, proactively reach out to prospects and answer their queries in real time through Zoho SalesIQ. Log in to your ProProfs administrator account, select “Settings” tab and choose the “Configure and Brands” option. Go to the “Integrations” tab. 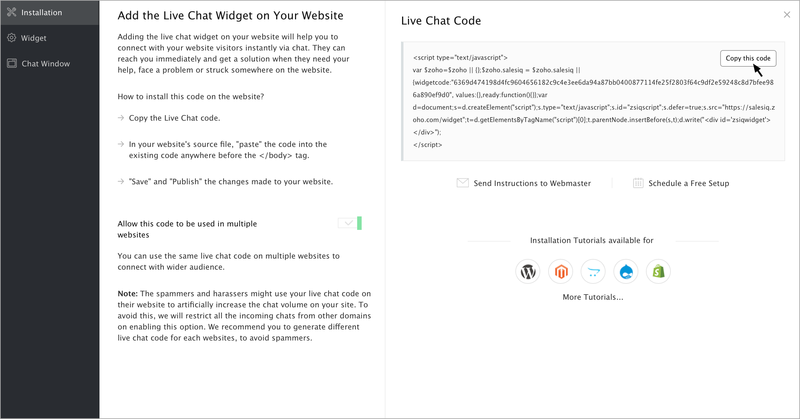 Scroll down to the section used for “Add chat and other third party integrations”. Paste your Zoho SalesIQ code in the "head" tag section and hit “Save” on the bottom of the page.